If the International Space Station were a city, then the truss that connects its modules would be, among other things, its power plant, public transportation, and closed-circuit surveillance systems. More than simply the frame for the other ISS components, the truss is a complex system on its own—a novel feat of engineering that is the backbone of the largest man-made structure ever put in orbit. 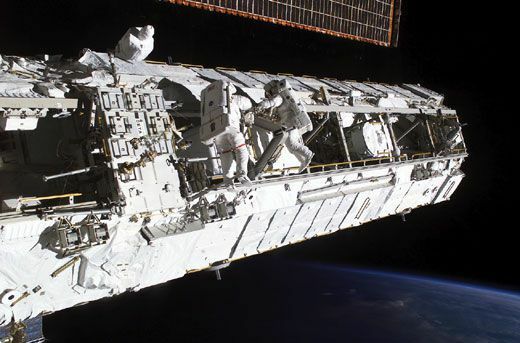 The main purpose of the truss is to hold solar arrays, their batteries, and necessary support systems, but it is also studded with sensors, antennas, ports for experiments, footholds for spacewalking astronauts, and a rail system for moving man and machine. When completed in 2010, the ISS will be four times the size of the Russian Mir, with the living space of a five-bedroom house. The 310-foot truss and attached acre of solar panels support this internal space and its tenants. The truss, made primarily of aluminum, is being bolted into place like a massive, zero-gravity Erector set. Spacewalking astronauts have been putting pre-fabricated pieces together by hand, with help from the largest of the station’s remotely controlled robotic arms. Since all the hardware is installed on Earth, as opposed to being assembled in orbit, fewer time-consuming spacewalks are needed. The station is required to support a six-person crew and supply power for the scientific experiments, says David McCann, a Boeing structures engineer who works on the program at NASA’s Johnson Space Center in Houston. (The company is in charge of the design and construction of all the U.S.-made parts of the station, including truss segments and solar arrays.) The mandate for a six-person habitat and numerous experimental labs determined the station’s size and power requirements. Engineers designed the truss as 11 easy-to-assemble pieces (eight are shown here) to be hauled by the space shuttle, the only heavy lifter available at the time. Traveling to the station, truss payloads are cocooned tightly inside the shuttle cargo bay, solar arrays folded. Once in orbit, the arrays open like 200-foot wings. When the ISS is completed, the truss is expected to generate more than 80 kilowatts of power.